Market Segmentation: How to do it and how to profit from it, revised and updated 4th Edition is the only book that spells out a totally dispassionate, systematic process for arriving at genuine, needs-based segments that can enable organizations to escape from the dreay, miserable, downward pricing spiral which results from getting market segmentation wrong. Nothing in business works unless markets are correctly defined, mapped, quantified and segmented. Why else have hundreds of billions of dollars been wasted on excellent initiatives such as TQM, BPR, Balanced Scorecards, Six Sigma, Knolwedge Management, Innovation, Relationship Marketing and, latterly, CRM? The answer, of course, is because of a structured approach to market segmentation. 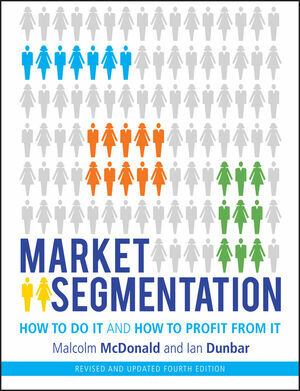 Market Segmentation: How to do it and how to profit from it, revised and updated 4th Edition provides a structured, no-nonsense approach to getting market segmentation right. It is an essential text for professionals and students based on a wealth of practical experience and packed with examples and easily used checklists. Malcolm McDonald was recently cited as one of the top marketing gurus in the world, along with Philip Kotler and Michael Porter and, in a 2006 Times HE piece, he was named as one of the top ten consultants in the UK. He is now Emeritus Professor at Cranfield University School of Management where, until recently, he was Professor of Marketing and Deputy Director. Formerly Marketing Director of Canada Dry, he is Chairman of six companies and works with many of the operating boards of the world’s biggest multinationals on every continent. He is the author of over 40 books, many of which have been translated into several foreign languages and has published hundreds of articles and papers. Although retiring from his teaching role, Malcolm continues to research and teach at Cranfield and other universities around the world and to promote himself via speaking engagements, visiting lectures, and consultancy. Ian Dunbar is a segmentation practitioner with extensive, hands on experience in segmenting markets for a wide range of business sectors. Since establishing the Market Segmentation Company with Malcolm McDonald in 1995, Ian has worked with numerous companies around the world ensuring their segmentation projects deliver the insights required for successful marketing strategies. He has held senior marketing positions in companies from both the service and manufacturing sectors and obtained his MBA from Cranfield University School of Management in the UK.